If you don't want to prepare sauce at home you can use any store-bought pasta sauce. If you don't have time to roast lots of vegetables you can add just one or two. Also, if you don't mind a dry-ish pasta made rich by the flavours of roasted vegetables, you can skip the sauce (just don't call it pasta in white sauce). You have so many options. So get going! 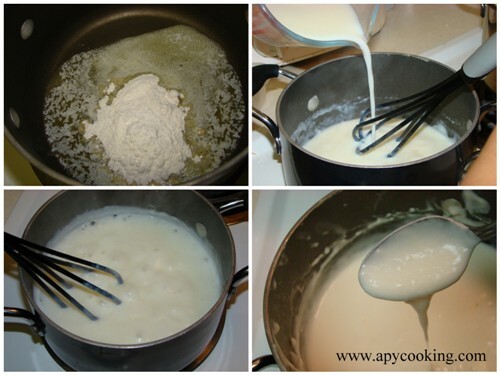 [ I don't like too much of white sauce in my pasta, but if you do, increase the measures]. Boil pasta according to package instructions - Boil water, add some salt and olive oil, pour pasta and cook till pasta is done (about 10 minutes). Drain. Reserve 1/2 cup of pasta water before draining. Chop vegetables. In a large deep-bottomed pan, heat oil. Add chopped garlic and sauté till you get an aroma. Add chopped vegetables starting with carrots and roast on medium flame. Cover and cook till vegetables become tender, stirring a few times in between. To this add red chilly flakes, ground black pepper and any other seasoning of your choice. Add salt to taste and mix well. Add cheese slice or grated mozarella and whisk. If you love cheese go ahead and add lots more. I added just 1 cheese slice since the white sauce itself looks and tastes cheesy (cheesy?). Add the water reserved while draining pasta and bring to a light boil. Add 1/4 tsp salt, 1 pinch nutmeg and mix. Now comes the fun part, combining all three. 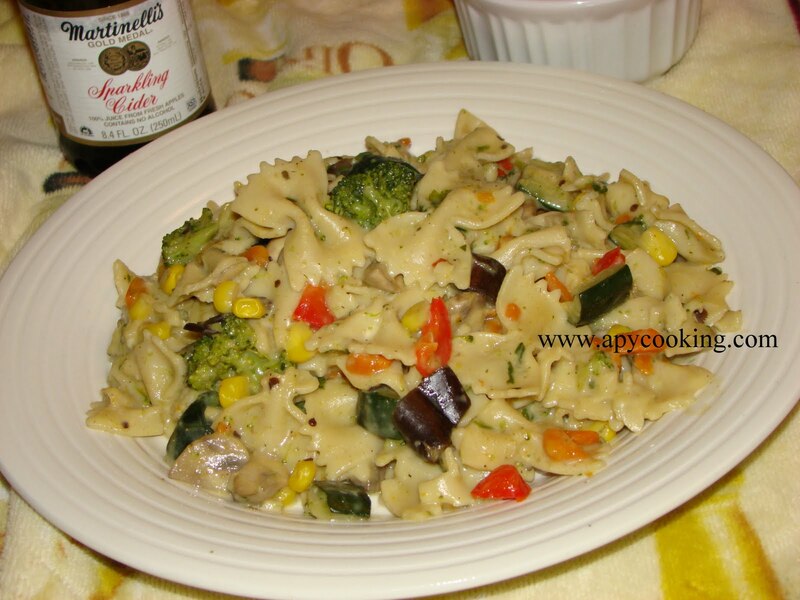 You can either mix them in the large pan in which you roasted the veggies, or you can layer them on your plate - spread pasta, arrange roasted vegetables and pour sauce all over. I prefer to mix them all in the pan, since I have a few other things to do than sit and arrange things over my plate - like stopping my son from climbing on the dining table. If you love the sight of your pasta drowning in white sauce then increase the portion of white sauce and cheese and treat yourself to a mouthwatering dish! 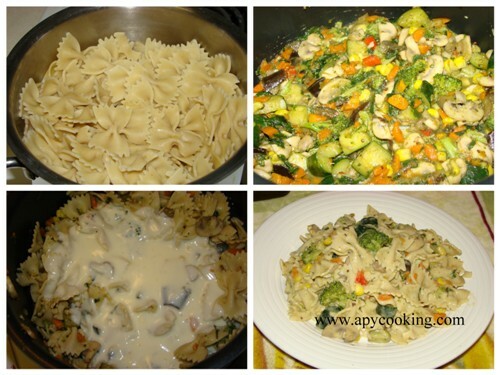 Pasta is my family favorite... your recipe looks lovely.. 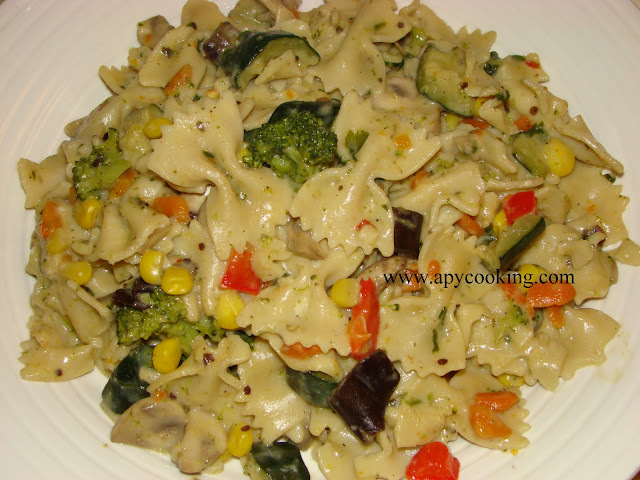 Pasta looks very yummy and awesome! Can have this simply inviting pastas even everyday,very tempting..
wonderful and delicious pasta !! I tried this for dinner today. Tastes very good. Thanks for trying, Nisha, glad you liked it.